These are just some of the comments from people in the recording session where former President of the Tarot Guild of Australia, Linda Marson, used her specially designed Self-reflection spread to show how you can do meaningful readings for yourself. Some people don’t believe we should do readings for ourselves but the reality is we all do and it’s a great way to start learning the cards. We’re only human, so one of the most common pitfalls is to keep shuffling until cards you like come out! 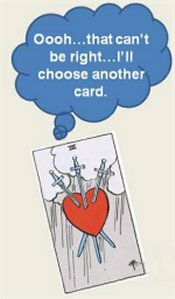 This is a big ‘no no’ – maybe you didn’t like the cards you first drew in answer to your question, but they’re the ones with the message you need. The recording comes with a comprehensive handout – extracts from Linda’s book, Ticket, Passport and Tarot Cards, which is all about reading the cards for yourself. It contains a copy of the Self reflection spread and a guide to questions to ask yourself for each of the Major Arcana cards. In the layout, the answer to your question is selected from the Major Arcana. Click here to download your FREE copy of the handout – sure to whet your appetite for this Tarot class! No longer content to write or produce TV programs about tarot and travel, Linda took people on tarot guided journeys to Peru for a number of years. She continues to do this through a partnership with Gothic Image Tours in the UK. Linda has been reading Tarot cards for over 20 years and for many years wrote for, and edited the tarot pages of Spheres, a spiritual magazine in Australia. She has presented workshops on various aspects of Tarot practice and organised major Tarot events involving internationally renowned Tarot experts. 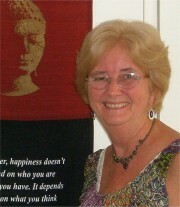 In 2011 she established Global Spiritual Studies. For more information about Linda visit her Experience the Tarot website. The video recording of the class is available for download to your computer or device as an MP4 file. It can be viewed on PCs using Windows Media Player and on Macs using the free VLC multimedia player for Mac operating systems which can be downloaded here.